Good facilities,professional staffs,good location and breakfast. Incredible staff.The reception if the most warm-hearted I have ever seen.I got problems with my booking and didn’t show up that night.They are willing to return to me half of the fee when they can easily find a reason and get me away.Also I was aggressive in one of my emails but the manager was very generous about it.Thank you. 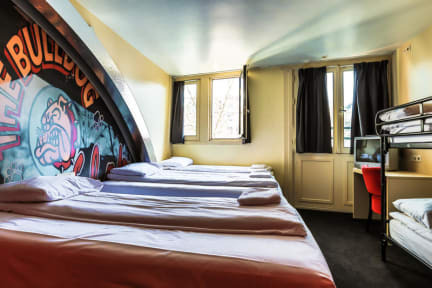 Good location,walk about 15 minutes to central station.Come here for ADE,you can very easy to go to clubs& venues for parties.The hostel also has a bar,you can enjoy food ,drinks & music ,awesome experience. Clean room,safe security. I left my phone when I checked out,they sent e-mail to inform me! Thanks for good service! 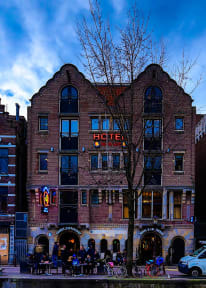 The position of this hostel is very good for our first travel on Amsterdam. You can see lots of beautiful scenes during the way from the station to hostel. The employ of hostel is very cordinal. I like the simple but delicious breakfast here. I will live here again if I travel here next time. Friendly staff providing the info you need. great location and good free breakfast. but strong smell of Cannabis in my room and some guests didn't observe the rule .